I hosted a small dinner party recently with only one request from my guests: that I provide a dessert that involved both chocolate and peanut butter. 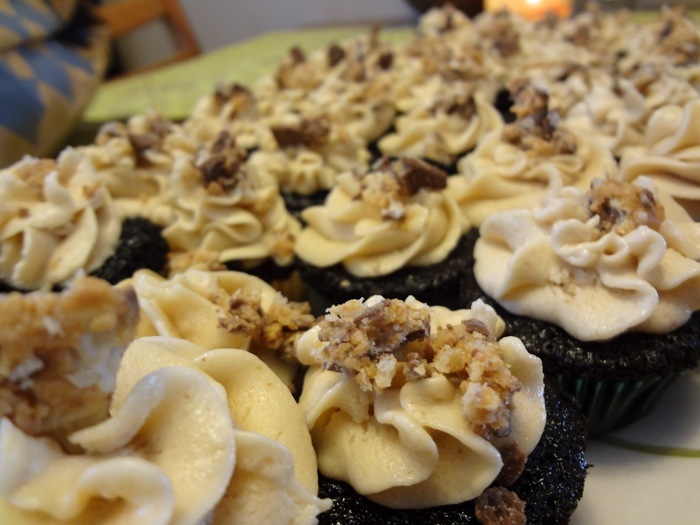 I couldn’t say no to such a classic flavor combination, and so these darling Dark Chocolate Peanut Butter Cupcakes were born! 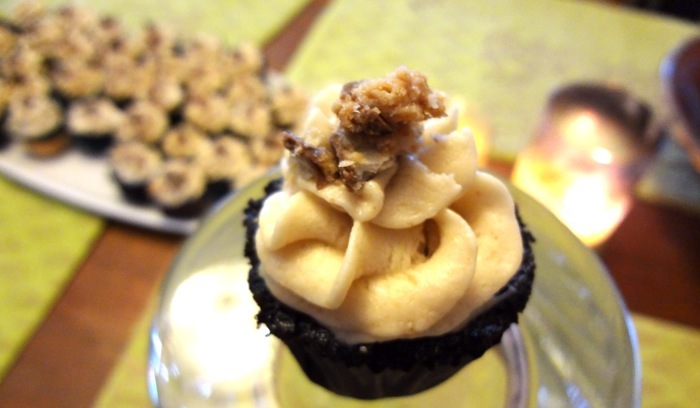 Next, I adapted the best buttercream frosting recipe (also from Sweetapolita) to become a fluffy, peanut-butter delight. This stuff turned out to be dangerous…it was very, very difficult not to eat all of the leftovers. To finish it off, I topped the beauties with chopped up ReeseSticks candy. Preheat oven to 350° F and line a muffin/cupcake pan – standard or mini both work well. In the bowl of electric mixer, sift all dry ingredients. In a medium bowl or measuring cup, combine the wet ingredients. Tip: if you don’t have buttermilk on hand, I have often substituted 2/3 cup milk plus 2 tsp. lemon juice or apple cider vinegar; it works beautifully. Bake for 15-17 minutes for standard cupcakes, 10-14 minutes for mini cupcakes, or until toothpick or skewer comes out with a few crumbs. Err on the early side for your first test-check to avoid over-baking. Remove from pan and cool completely on a wire rack before frosting. In the bowl of an electric mixer, whip butter for 8 minutes on medium speed. Butter will become very pale and creamy. Add first amount of powdered sugar, milk, vanilla and mix on low-speed for 1 minute, then on medium speed for 6 minutes. Frosting will be very light, creamy, and fluffy. Add peanut butter and continue to mix on medium speed for 3 minutes. Incorporate remaining powdered sugar in increments until frosting is again fluffy. You may not need all of this sugar; it will depend a bit on the consistency of your peanut butter. Add salt to taste. I find that a bit more salt really brings out the peanut flavor in a delicious way! Y’all are rockin’ it with the cupcake recipes lately. This one would be a huge hit with my husband, who loves chocolate peanut butter almost as much as he loves me. Well, that might be slightly exaggerated, but only slightly. 😉 Thanks for sharing!